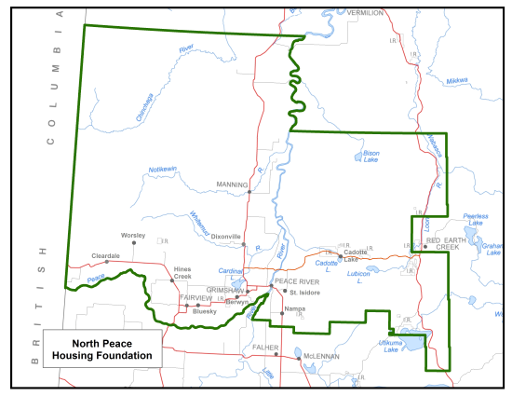 The North Peace Housing Foundation is a management body established by Ministerial Order under the Alberta Housing Act to provide adequate and suitable housing in a variety of housing types that are accessible to low-income households in need. On April 11, 1960, through the signature of the lieutenant governor in council, the North Peace Foundation was born. A provincial government initiative to construct fifty retirement homes for seniors brought the first lodge to this area in Berwyn. Through an agreement of twelve municipalities, the Foundation was established to oversee the operation of the Autumn Lodge and to help provide for any funding shortfalls required to provide affordable room and board for seniors of the area. This inter-municipal co-operation, that is a key to the success of the foundation, is something that still exists today. For the first fifteen years of its existence, the Board worked to perfect the operation of the Autumn Lodge, and build a strong bond amongst the twelve municipalities. Over time the Foundation took on the challenge of entering new service areas as lodges were constructed in Manning in 1976, Hines Creek in 1983 and Peace River in 1985. The ten year period between 1975 and 1985 was a time of great expansion for the Foundation, as the organization also oversaw the construction and management of new apartment buildings for seniors. A total of 133 seniors apartment units were constructed and managed by the Foundation in five communities over this ten year period. In 1994, the Foundation was asked to spearhead a project to consolidate housing agencies in the North Peace. Again, the Foundation accepted the challenge, consolidating the operations of seven housing agency under the Foundation umbrella. This process brought both a change in our mandate as well as a change in our name. Under the Alberta Housing Act, the North Peace Housing Foundation took on the management of 164 homes for low income families, as well as an additional 40 seniors apartments units. The Foundation was at that time managing over five hundred housing units. Through an expansion to the Del-Air Lodge in 1999 and the construction of the Harvest Lodge in Fairview in 2001, the Foundation increased the supply of senior supportive living units in the Peace by about 80 units, and now provides supportive housing options to over 230 seniors in the region in five seniors lodges. In 2006, the Foundation undertook the development of a new affordable housing program for remote areas. In 2007, the Foundation developed a subdivision in the hamlet of Cadotte Lake, delivering 8 manufactured homes to house families within that community. In 2012, the Foundation began development of a new seniors affordable housing project on the west hill in Peace River. The doors to Garden Court were officially opened in late 2013 to its first residents. The Foundation now manages a portfolio of seniors and family housing units throughout the region, now totalling 678 units.